We took thirteen of the highest rated and most popular backpacking backpacks on the market and reviewed them side-by-side for over five months of in-the-field days. We picked versatile packs that an average person would use on trips of two to eight days, but are also capable of going up to a twenty-two day unsupported trip, as proven several times by our field people. The backpacking backpacks we reviewed here are more load ’em up and charge type packs, not to be confused with ultralight frameless packs. The best backpack out there, hands down. It's packed full of functional features is ultra comfortable, and ventilates fantastically all at a lighter than average at 4 lbs 6 oz. The Osprey Atmos 65 AG is our favorite backpack because it’s packed full of functional features, is ultra comfortable, and ventilates fantastically. All that at a light weight of 4 lbs 6 oz. The greatest thing about the Atmos is its suspension and simply how comfortable it is; it spreads the load out evenly makes your pack actually seem lighter than it is. For trips where we were carrying less than 40 lbs, this was hands down the most comfortable pack between the considered choices. Another big advantage is the ergonomics of the Atmos from the frame to the waist belt. We found there are probably very few people that the Atmos 65 AG won’t fit well. For the pack itself, we love the Atmos’ refined design, which was among our overall favorites in the review: every additional pocket is in the right place, is the right size, with few features we think to be useless. It’s only downfall: the Anti-Gravity suspension doesn’t carry super heavy loads (45+ pounds) as comfortably as some of our other picks. The Baltoro remains the straight-up best pack in our review for carrying monster loads (more than 60 lbs) and offers a plethora of features. The new and improved Gregory Baltoro 65 is just as comfortable as ever and offers improved features and usability while somehow weighing 8 ounces less than the previous model. The Baltoro remains the straight-up best pack in our review for carrying monster loads (more than 60 lbs) and offers a plethora of features. It’s a little heavier than other models, but if you need to carry a significant amount of weight or access is super important to you, then the Baltoro should certainly be on your radar. We found this pack to be super burly and more than $100 less expensive than the Arc’teryx Bora AR 63. The only downside to the Baltoro is the weight at 5 lbs 3 oz; it is slightly heavier than other packs in our review, but not by much. If you know you are going to need to carry a lot of stuff, need a lot of support, or just like this pack’s comfort, features, and toughness, the Baltoro remains a sweet pack that will last (nearly) forever and gives you a ton of features for your money. If you frequent trips of 5-20 days or trips that require you to carry a lot of gear, then the Xenith is the pack for you. The Osprey Xenith 75 is the best pack for extended trips. If you frequent trips of 5-20 days, the Xenith is the pack for you. With 75L, 85L, and 105L options, we think it just hits the sweet spot of a great suspension and very good ergonomics, while offering nice features and a a great assortment of pockets for extended trips. Both the Baltoro and the Xenith are great packs for carrying heavy loads and it was tough to choose between them. In the end, they both proved to be awesome packs; the only difference between the two came down to slight personal preferences. The Best Value choice is the Osprey Volt 75 because it combines solid comfort and performance with excellent value. The Best Value choice is the Osprey Volt 75 because it combines solid comfort and performance with excellent value. The $200 Volt 75 or the identical, but slightly smaller $180 Volt 60, scored fairly high in most categories and scored better overall than several much more expensive packs. The Osprey Volt 75 appeals especially to people who appreciate its simplicity: not tons of extra pockets or pouches; just the essentials and a slightly above average frame, padding and ergonomics. While the Volt 75 is not feature-heavy, it does have all the key features that backpackers care about the most about like a lid pocket, dual entry water bottle pockets, stretchy beavertail pocket and a lower zippered access point (AKA sleeping bag compartment), among other things. What we’ve really noticed is that the Volt has better, more ergonomic shoulder straps, nicer foam, and better feeling face materials than most other packs in its price range. The Volt is also an excellent option for parents looking to buy a solid pack for a younger teenager or pre-teen that will grow with the child until they’re in their twenties or beyond. That said, the REI Flash 65 is an extremely strong contender for our Best Buy, as it also costs $200 and is couple ounces lighter (it was almost a toss-up between these two packs). The Osprey Exos 58 is the lightest pack, yet still very comfortable; it is also one of the least expensive packs we reviewed. 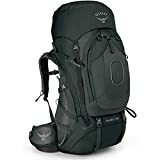 The Osprey Exos 58 is the lightest backpack in this list, yet still very comfortable; it is also one of the least expensive packs in this review. It is almost as lightweight as some of the other frameless minimalist lightweight packs, but still has the essential features (including a frame). It’s good for people who go fairly light already but want a little more suspension and comfort that a frameless pack doesn’t provide. 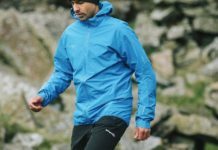 The REI Flash 65 was a strong contender for best lightweight, but it was edged out by the Exos for comfort and durability. Our former overall best pick was the Arc’teryx Bora AR 63. Its overall performance remains spectacular. The Bora AR 63 was among the most comfortable packs we reviewed, even with heavier (60+lbs) loads, yet was surprisingly lightweight considering its frame and number of features. We loved the comfort and support the pivoting waist belt provided, as well as the nicely articulated shoulder straps, which were among the best in our review. The Bora has excellent access with its perfectly sized and useable full-length pocket. It remains a great choice for the ultimate multi-day backpacking pack; the only bummer: it lacks a few small features that other packs in our review had and the price, at nearly $400, it is the most expensive pack in our review. Something we questioned was the Bora’s durability; the fabric just doesn’t feel as tough as several other packs we reviewed, but after literally over 100 days of relatively hard use, we have no evidence to back up this hypothesis of a lack of durability. Ours is still going strong. 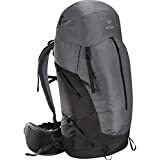 The North Face Banchee 65 was a contender for Editors’ Choice because it’s such a comfortable and supportive pack that was one of our favorite overall pack design regarding features; this pack had some of our favorite pockets that we wished a lot of other models had. 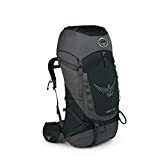 Not only we loved the design of this very user-friendly pack, but at 3 lbs 10 ounces, we loved that is was around a pound lighter than nearly all of our award winners except the Osprey Exos 58. In fact, we liked the pockets and organizational ability of the Banchee 65 a little better than our Editors’ Choice award winner, the Osprey Atmos 65 AG, but we thought the Atmos was just enough more comfortable to make it our overall award winner. There is a lot to take into account when selecting the right backpacking pack; whether it’s your first bag or you’re just adding a second to your gear. In this review, we compared the best and most popular men’s backpacking backpacks. These packs are the type of packs that most people will be drawn toward and will use for day-in and day-out backpacking. While the packs we chose to review could be used for travel, such as backpacking through Europe, and most are versatile enough for some general mountaineering applications, these packs aren’t necessarily made specifically for those activities. We reviewed these backpacking backpacks and compared them in five different categories. Comfort not only includes how well the pack feels on even ground and nice trails but also how the pack moves with you on difficult cross-country terrains, like bushwhacking and log crossings. For our comfort category, we reviewed how comfy each pack’s frame, shoulder straps, and hip belt are. We compared these packs mostly with more standard 30-45 lb loads that most backpackers might carry for up to week-long trips as well as a “load hauler” type loads where we compared each pack with 55-65 lbs for a little longer than our hips and shoulders would have liked. We paid extra attention to how the waist belt and shoulder straps felt on each pack after wearing them for long days and with heavy loads. We took into account other feedback from friends and other sources on the internet to help give us a broader and less single body type perspective when choosing the most comfortable pack. The Osprey Atmos 65 AG is one of the most comfortable packs in our review. For heavier loads, the Gregory Baltoro 65 and the Osprey Xenith 75 tied for the most comfortable product in this category. Equally as important as the foam, are the well-designed and articulated shoulder straps of these packs that match the shape of most people the best. Not far behind the Xenith 75 and the Baltoro was the Gregory Contour 60 and the Arc’teryx Bora AR 63. The North Face Banchee 65 and Osprey Aether 60 and 70L packs weren’t quite as comfortable as the two packs listed above, but they weren’t very far behind either. For medium and lighter loads of around 25-45 lbs, we noticed significantly less of a difference between packs, but once we crested 40 pounds, additional weight was exponentially challenging for packs to handle. The fabric Osprey uses on the inside of the shoulder straps of the Osprey Xenith 75 and Osprey Aether 70, and the feeling of the Atmos 65 AG was our favorite on bare skin; the shape and articulation of these packs were second to none. The Aircontact’s shoulder straps and waist belt were very comfortable, but not quite as comfortable as the Xenith 75 and Baltoro 65. The Air Contact’s padding is noticeably bulkier and hotter and the shoulder straps are not shaped quite as nice. If you feel like you carry more than 40-45 lbs on a regular basis, we would recommend the Xenith 75, Bora AR 63, or the Baltoro 65. If you’re not going to commonly carry 40 or more pounds, we loved how the Osprey Atmos 65 AG and The North Face Banchee 65 felt as long as we didn’t overload them. These packs felt as good as our OutdoorGearLab Top Pick, the Arc’tyrx Xenith 75 or Gregory Baltoro 65 to around 40 lbs, but above 50 lbs, the Xenith and Baltoro were superior. The Suspension category is simply how well the frame transferred the weight from the backpack into the waist belt and to a lesser extent, onto our shoulder straps. The suspension is obviously tied-in with a pack’s overall comfort, but we specified unique criteria for each category. In addition, we compared the foam used and the articulation, and how great the pack feels to carry against your back. 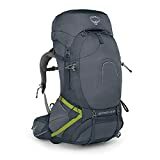 The Gregory Baltoro 65, Osprey Xenith and Arc’teryx Bora are all fantastic packs, suspension-wise, while the Xenith and the Baltoro just barely edged out the Bora and the Contour, given how great the frame transfers the load to your hips. With these two packs, very heavy loads were noticeably not as bad to carry. That said, we did like how supportive and comfortable the foam on the Bora and the Aether were. The Osprey Atmos 65 AG, while super comfortable when loading below 45 pounds, is not that great for loads above that, when its suspension doesn’t fare as well. The Deuter Air Contact was just a hair behind the Baltoro; it featured thick and comfortable padding and a supportive frame – we think it feels a little bulky. Trampoline-style or suspended suspension systems generally use a mesh back panel that is suspended over a more traditional frame. The advantages of this type of frame are that it allows more air to ventilate making these backpacks cooler and less sweaty and they tend to produce fewer heat areas on the users back because the weight is spread out or “suspended” over a larger area of the wearer. More and more packs are using a similar design at least on the back panel portion of a pack. We generally like the trampoline suspension because of the aforementioned reasons, except when you’re carrying very heavy loads. In this case, not having a gap will be more much comfortable. Also with all suspension style systems there comes a limit to the weight you can carry, where it starts to feel uncomfortable. The idea of the trampoline suspension is instead of having your back right up against the pack, instead, your back is against a mesh back panel that is suspended over a more traditional frame. The advantages of this type of frame is that they tend to produce less hot spots on the user because the weight is suspended over a larger area and it allows more air to ventilate making these backpacks cooler and less sweaty. There only disadvantage; they don’t handle super heavy (50+ pounds) as well before the start to feel mushy and the suspension sort of half collapses. Our ease of use category includes how easy a given backpack was to pack and the design of the main compartment and additional pockets. In regards to pockets, we considered the number of additional pockets, and how easy it was to access the main compartment of the backpack. The Baltoro 65, which is on the heavier side of packs in our review at 5 lbs 3 oz, and the Banchee 65, one of the lighter ones, we found our favorite collection of pockets with these two packs. The Deuter Air Contact has nearly as many pockets as either of the aforementioned packs, but we felt that they weren’t as useful and neither were super easy to access. It’s worth noting that the REI Flash 65 had nearly as many usable pockets and close to as much access featuring a “J” shaped opening; the cost is also only $200. Nearly every pack sports has a zippered top lid pocket. This exceptionally common pocket is the best pocket to store small items among other things wanted close at hand. We like this feature, as it’s a great place to put those items you want access to, but don’t need as frequently. The Arc’teryx Bora pack has our favorite overall lid design because of the two pockets are big, but also open from the top your stuff won’t fall out and it is easy to search through. Of all the packs we reviewed, our favorite top-lid pockets belonged to the Arc’terx Bora AR 63 and Gregory Baltoro 65; they were just straight-up the most usable. They both featured two pockets on the very top of the pack that made finding items easier. Items also didn’t fall while we routed around. We loved the dual zippered lid pockets on the Gregory Baltoro 65. These pockets not only helped users stay more organized but because of their upward orientation they were both easy to access and search through. Pack access refers to how easily we could access certain larger items without having to unpack the whole pack. While this is an obviously useful feature for anyone using a backpack, its level of importance depends on the user. 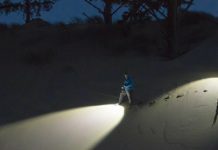 Ease of access is an especially useful feature for folks using their backpack for travel, where they might otherwise use a suitcase or a duffel bag, to go “backpacking” through certain regions. No one likely disagrees on having more or easier access in principle, but on the other side of the argument, access zippers add weight that aren’t physically essential, but rather convenient. This is a delicate balance that anyone purchasing a pack must weigh; consider your tendencies before thinking to yourself “I want more access”. Do you need it because of how or what you pack? Or do you think you want it because it just sounds nice? All the packs we reviewed were top loading, and many had side access zippers, sleeping bag compartments, or entire panels that opened to allow access. Among all the packs we checked, we loved the Arc’teryx Bora AR 63 and Gregory Baltoro the most. The REI Flash 65, with its “J” shaped zipper, had very good access and above average for our review, but not quite as good as either of these two packs. While not a must-have, most of the backpackers we talked to appreciated having at least one zippered pocket on the hip belt where you can store stuff like gels, cliff bars, or a small bag of nuts. The North Face Banchee 65, along with the Osprey Volt 75, Xenith 75, and Atmos 65 AG all had some of our favorite hip belt pockets in the review. While hip belt pockets are hardly a mandatory feature of a backpacking pack, it’s nice to have one that’s big enough to fit either some snacks or a point-and-shoot camera. Most of the packs have a place for a hydration bladder. Check our Hydration Packs Review for more info. The Osprey Exos 58 is the lightest pack between the options we analyzed, at 2lbs 8 ounces. 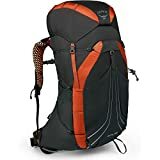 For a lighter and more featured backpack, we would like the North Face Banchee 65 or the REI Flash 65 (both 3 lbs 10 oz) and would certainly consider the Osprey Volt 75 (3 lbs 12 oz), or the Gregory Z65 (4 lbs 3 oz). They all hit a nice balance of being lightweight, but still comfortable and fairly full featured. Among more full-featured packs, the Osprey Atmos 65 AG (4 lbs 6 oz), Osprey Aether 60 (4 lbs 11 ounces) and the Arc’teryx Bora AR 63 (4 lbs. 13 oz) remain lighter than average and give up very little in the way of comfort, load hauling ability, and features. 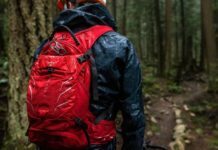 A pack’s overall ergonomics, the more adjustable a pack is, and the more sizes it is offered in typically translates to a better fitting pack. Many manufacturers offer the option to change shoulder straps and waist belts for different sizes (for example if you want a medium frame and a small waist belt), something that many stores and websites offer for free. The Deuter Air Contact and the Osprey Volt 75 has the most vertical adjustability for the yoke’s (shoulder straps) positioning, not only helping it to fit a wide range of hikers but also making them a good pick for teens. Despite this feature, we didn’t think either pack had the best overall fit. Below I’ve gave my personal opinion on my experience as a backpacker. What are the most important things that you look for when buying a new backpack? The most important thing is fit. Try all brands and styles to find the right fit for you. Then I look at how light the backpack is and compare that to how durable it seems. And then I’ll consider its volume. What special or specific features do you like in your backpacks? I use a Camelbak or other similar hydration system because I find I stay much better hydrated when I can drink whenever I want. So I look to see if the pack is hydration system compatible. Another thing I like is to have waist belt pockets so I can keep a few things handy when I have the pack on my back. A quick access pouch on the outside is also good so I can stash a jacket if I get too warm, etc. What do you do if you need a little more space to carry things? I’ll usually extend the lid as far up as it will go and put things between the pack and lid, securing it by strapping the lid down. I’ll use the straps on the pack or other straps to secure things to the outside of the pack. I also keep a few small carabineers around to clip small light things on the outside. What’s your strategy for packing your gear in your backpack? I put my sleeping bag on the very bottom, usually because it’s the bulkiest item. Then I go with the heaviest things towards the center of my pack, not too high. Filling up all the little nooks and crannies is important to save on space. I make sure to keep snacks and clothing layers I’ll need throughout the day near the top for easy access. Do you like lots of straps, buckles, and pockets, or a more simple design? I generally like a more simple design but not too streamlined. I like a few straps to help cinch things up and to strap extra things on if I need to. I also like at least one outside pocket for things I need to easily access throughout the day. Although comfort is important, I like a light pack and I don’t need excessive padding or size adjusters all over. What types of accessories do you use with your backpack and what do you consider when buying them? If I’m backpacking I usually use a Camelbak, so I like to have a hole for the tube to come out and something handy to hold the bottom of the tube near my shoulder. I also use a rain cover for the pack. Do you prefer a really large pack to make sure you have room for everything, or do you prefer trying to save weight and go light? I always prefer to go light. The more you backpack, the more you realize things that you are ok going without, making everything lighter and simpler on the trail. What do you think are the most important things to forgo (or not) when trying to lighten up the weight of your backpack (or general gear)? And what about for durability? I forgo extra clothing. I only bring the very essentials to stay warm and dry, which is usually one extra set of clothing. Food is very important, but also heavy. So I try to be super accurate about how much I’ll eat so as not to have too much extra. Where are your favorite places that you’ve been backpacking? The Wind River Mountains in Wyoming, the Highline trail in the Uintas in Utah, and Escalante Grand Staircase National Monument in Utah. Do you have any tips for what to bring or not to bring to save space or weight? Forgo deodorant, maybe even a hairbrush. Bring mini everything and try to be creative about things that can have multiple purposes. Crocs make good river crossing and camp shoes. Although most people I know use extra clothing, I bring a small, compressible pillow; it’s worth it to me. I bring an extra absorbent hand towel for drying off after creek bathing. 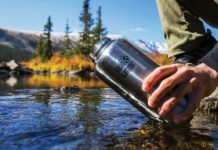 I prefer a Steripen to water filter, which saves a lot of weight and space, but that also depends on the water sources you’ll be encountering. A few freeze dried or dehydrated dinners save weight.